Although fatigued, Lama Zopa Rinpoche maintained his characteristic playfulness while recovering in the hospital, May 2011. We Welcome Two New Study Groups! Khadro-la arrived on May 25 and spent most of the day with Rinpoche doing pujas, prayers and so on – as well as a lot of laughing (most therapeutic). Rinpoche wanted to send his heartfelt thanks to all the students, centers, projects and services for all their practices and prayers. 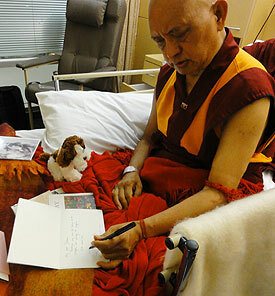 Even while in the hospital and without the use of his right hand, Lama Zopa Rinpoche kept up on his correspondence by learning to write with the left, May 2011. Holiness the Dalai Lama and all holy beings, who live their life benefiting others, and to all those who live in morality – not harming others – also specifically to dedicate to all beings who have high blood pressure, diabetes and paralysis. Ven. Roger Kunsang is keeping us all updated on Rinpoche’s recovery from the stroke through Rinpoche’s Health – Updates and Practices. It is possible to subscribe to the RSS feed in order to ensure you find out the latest news the minute it’s posted. “So I guess you know I didn’t take care well, [didn’t do] daily exercise, didn’t get to do daily walking and so forth, [I was] very weak. So then I think my self-cherishing thought went up, then paralysis happened. The doctors all think it’s getting better, [I am] past danger, they all think I will get better soon. By propping his clasped hand on the table in front of him, Lama Zopa Rinpoche is able to keep his hands in the mudra of prostration while he offers his food, May 2011. Photo by Ven. Holy Ansett. blood pressure, diabetes and paralysis. Also I pray to try to do this. It is an incredible opportunity, when I do that it purifies many, many, many – wow, can you imagine? – many eons of negative karma, wow, wow, so it is the quickest path to enlightenment. “In the hospital I try to practice. I dedicate past, present, future merits to any people who come into my room or this hospital, or into the hospital before this. That any person who from now on comes into this room, any sick people who come, may they immediately recover from their sickness. Then any person who sits in my bed [in the hospital] from now on, may they immediately recover from their sickness, or if they die, may they never ever be born in the lower realms, may they get reborn in Buddha’s pure land. I try to pray like this a few times a day. So wonderful, positive, to bring benefit here, so I try to do what I can. “Then I realized today, usually I try to do 10,000 OM MANI PADME HUM [mantras per day], I increased this year to 20,000 OM MANI PADME HUM [mantras per day], and I turn the prayer wheel. I try to do three times the very, very, very long mantra, then the middle one, then OM MANI PADME HUM. [Rinpoche lists some of the benefits from reciting these mantras.] When I recite, I turn the prayer wheel, so this hand turns the prayer wheel and this hand [moves the] mala. So today and over the last few days I didn’t get this done, so today I tried, but I can’t use this hand, I can’t turn the prayer wheel. I recite 20,000 mantras and then from time to time I turn the prayer wheel, but I can’t do both, not possible. So incredible, with your hands free you can recite and turn a prayer wheel and count mantra, wow, wow, wow, what merits, the cause of enlightenment, with bodhichitta, incredible, unbelievable, unbelievable, with both hands free. So I realized how precious it is if you can use both hands, so precious. “Then normally I do prostration to my altar, so before I always prostrate with two hands to my Gurus, Buddha, [but now] I can’t use both hands, so I realized how fortunate it is if one can prostrate with both hands. With two hands it is so easy to create the cause of enlightenment, so easy to get the highest success in life. I told people you are so fortunate you can do that, I can’t do that, so I realize how precious the body is, how you can [use it to be] so precious, so easy to create the cause of enlightenment. “Thank you very much for the Medicine Buddha pujas, for everybody’s prayers and practice. “I am just experiencing my short comings of self-cherishing mind. According to one view, I lost and it won, that is according to one view. Then according to another view this [sickness] is the best thing to achieve enlightenment, the quickest way to achieve enlightenment. Colophon: Taken from some dictation given by Rinpoche to Ven. Holly Ansett while in the hospital in Australia, May 2011. Lightly edited by Claire Isitt. Rinpoche said: “… if each monk can do 1,000 times the long Namgyälma mantra. Nalanda can offer 1,000 of each offering (water, flowers, incense, light, perfume, food). To recite this mantra 1,000 times is very powerful; if you can clean well the body, wear clean dress, take Eight Mahayana Precepts, then do the practice, recite that mantra. “As soon as we got Rinpoche’s message we began setting up the gompa with a thousand of each type of offering, which was wonderful to do even if it left little space for people to sit down. It was great fun and most of the Sangha helped in setting things up. I’ve uploaded a photo album to Picasa for Rinpoche to see, since attaching photos would be far too big. “As May is our study term break, most of the monks began to take a holiday as they’d made flight bookings, etc., but some of the monks here are still continuing with the three sessions a day at Nalanda. “Those monks who are away for the break have been instructed to continue with the recitation until further instructions come to stop or if the 1,000 long mantras are completed. They’ve also been sent a copy of the Namgyälma text to continue the practice from a distance. “So far, some of the monks have completed the 1,000 long Namgyälma mantras, and a few more are close to finishing (by the end of the week). I’m in the process of collecting actual numbers, but as it is continuing daily, it will be changing quickly. “Even with or without medicine you can recover from sicknesses which are caused by karma and delusions, but you cannot recover forever. It is impossible to experience a recovery from sickness forever not only in this life but in all future lives. This is not possible because medicine does not remove the cause, which is karma and delusions; medicine can heal but only temporarily because it does not purify karma and delusions; that is why it cannot cure you forever. “I’m joking. ‘Oh, if you take out all my anger then I will have no support,’ you feel as if you have no support. This would be similar with attachment. “Anyway you cannot operate on ignorance, anger, attachment; you cannot operate with scissors or weapons or with knives, you can’t take them out. You can only operate on the gross physical things, such as cutting out cancer and other cells. In the hospital one cannot operate on the mind with those tools, take out the delusions, take out the self-cherishing thought so that you make the person totally pure – without self-cherishing thought – so that then the person has only bodhichitta. Colophon: Teaching given during the retreat in Bendigo, Australia, on April 3, 2011. Transcribed live from Rinpoche’s teaching by Ven. Joan Nicell, edited by Alan Carter and Claire Isitt. 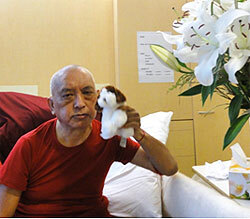 The following schedule is dependent upon Rinpoche’s recovery and health needs. It is therefore a tentative schedule. Please keep reading updates sent via the FPMT and CPMT e-groups or on Rinpoche’s Health – Updates and Practices. Also, keep checking Rinpoche’s Schedule. On June 16, when His Holiness the Dalai Lama visits Chenrezig Institute in Australia, FPMT will take the opportunity to make an offering to His Holiness, dedicated for His Holiness’ long life and the fulfillment of all his wishes. You can make your contribution online. The deadline for us to receive your donation if you would like your name to be included in the list of donors is June 7. Lama Zopa Rinpoche’s vision and capacity for serving others is limitless, reaching far and wide to offer service, guidance and education wherever there is need. If you are inspired by Rinpoche’s compassionate contributions to the world, please join us on Saka Dawa, June 15, as we Work a Day for Rinpoche. Stay posted for the official launch of the 2011 Work a Day for Rinpoche campaign – a movement to support Rinpoche and his work year-round. In the meantime, join your fellow “co-workers” and follow the campaign’s developments on Facebook. We are happy to note that many of you are enjoying the new translate service on the FPMT website! If you haven’t tried it yet, simply click on the “Translate” drop-down menu on the right-hand side of any page of the FPMT website in order to select the language in which you would prefer to read. FREE! Living in the Path Module 1, Motivation for Life, now available in Spanish! ¡GRATIS! ¡Vivir el camino Módulo 01, La motivación para vivir, ahora está disponible en español! FREE! 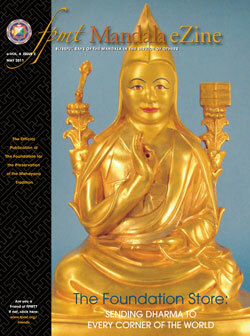 The 2011 teachings on Lama Tsongkhapa Guru Yoga from Amitabha Buddhist Centre, Singapore, have now been added to the OLC under the “Special Commentaries” section. The first three days are available in video format and the last two days are currently available only in streaming audio format. An unchecked transcript of all five days is also provided. REMINDER! All online materials are available for free by becoming a Friend of FPMT at the Dharma Supporter level or higher. Alternatively, all online modules are available via The Foundation Store. Basic Program Study Manual for Chapter 4 of Ornament for Clear Realization is available as a PDF. This manual is a study guide for the fourth chapter of Abhisamayalamkara by Maitreya, composed to support the study of this FPMT Basic Program subject. It was compiled by Emily Hsu and Kok Wai Cheong, and revised by Sally Ong and Ven. Sangye Khadro. The same study guide is available in Spanish and French. French and Spanish Basic Program materials on the web have been updated. Sanghata Sutra now available in e-book format. Meditations on Guru Devotion, Parts I, II and III, led by Ven. Sarah Thresher, are now available for download. The latest Mandala eZine is released! This edition’s cover story, “The Foundation Store: Sending Dharma to Every Corner of the World,” shines a light on one of FPMT’s online jewels. Through The Foundation Store you can find FPMT prayer books, beautifully crafted statues, baseball caps embroidered with holy mantras plus so much more! Get the story behind the online store and learn how it supports the vision of Lama Yeshe and Lama Zopa Rinpoche. Rinpoche leading a meditation on the Diamond Cutter Sutra from the FPMT Online Learning Center’s Living in the Path. NB: Lama Zopa Rinpoche’s extensive commentary on guru devotion, The Heart of the Path, is back in stock! Every year for the last nine years, FPMT has celebrated the Sangha, our community of ordained students, on the auspicious day marking the First Turning of the Wheel of Dharma. This year that falls on August 3, 2011. As well as encouraging centers, projects and services to celebrate our precious Sangha, this is also the day on which we recommend you make your annual donation to the Lama Yeshe Sangha Fund. More information coming via the CPMT e-group soon! Land of Joy – a probationary project working to establish a retreat facility together with a residential community and more in the UK. Tara Home, a hospice project of Land of Medicine Buddha since 1998, has taken the steps to become an independent probationary FPMT project – congratulations! Chenrezig Institute, Australia – Salt featured the Garden of Enlightenment with a lovely interview with its project manager, Garrey Foulkes, and how he worked extra hard to complete the garden in time for His Holiness the Dalai Lama’s visit this June. Jamyang Buddhist Centre, London, UK is looking for a new director; Root Institute, Bodhgaya, India needs a spiritual program coordinator; the Maitreya Project Relic Tour needs a tour manager for North America; Shedrup Ling, Mongolia needs an English language teacher and Vajrapani Institute in California, USA is looking for a resident Sangha member, an IT manager and a project assistant, among other positions.